Hahaha Clive, tell you why everyone remembers YMPA- Paddy Berger had just joined and was setting the world on fire. He was such an exciting player back then. "In coping with the loss of Ian Rush Liverpool not only sought to replace his goals, but they actually went for a lookalike. He may not have had the pace of Rush or his ability to defend from the front, but Aldridge was the supreme poacher. He plundered an unbelievable 50 goals in just 83 appearances. It is hard to imagine such a tally in the modern game. It is Messi- and Ronaldoesque. To Kopites of all generations John Aldridge had everything it takes to become an Anfield favourite. He was a Scouser born an bred, he absolutely adored Liverpool football club and he scored goals for fun. Aldo was affected badly following the Hillsborough disaster in 1989. I’ve seen interviews where he talks of thoughts he had about quitting the game. Thankfully he didn’t and he played a key role in getting Liverpool back to an emotional reunion with blue half of the city at Wembley. 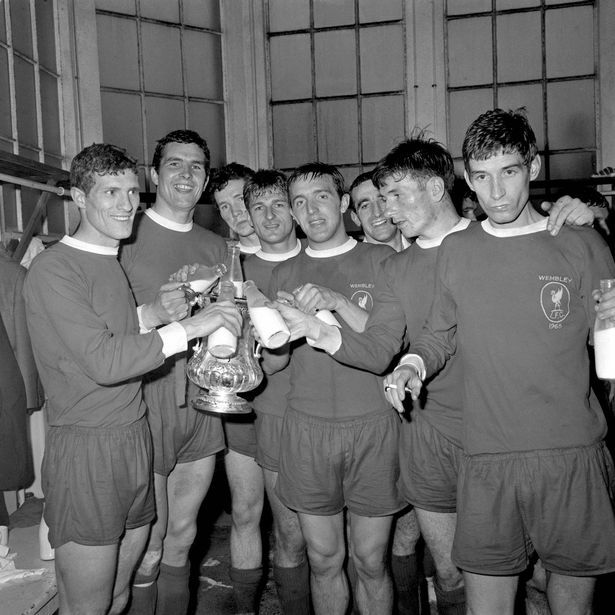 The Reds, of course went on to win the FA Cup that year. Aldridge never wanted to leave Liverpool and at least on The Kop the feeling was mutual. His last game was one of the most emotional ever at Anfield, with the player throwing his boots, sock, shorts and shirt into the famous terrace he had stood on a child, before running off in his underwear. I still find it hard to decipher why Liverpool could ever contemplate selling such a prolific goalscorer in the peak of his powers, but that’s exactly what we did. " How do you remember Steve Finnan in a Liverpool shirt? Arrived at Anfield from Fulham for £3.5 million in 2003 and made 217 appearances over the following five years.. What match epitomized his grit and determination? What were his strengths/weaknesses? What are your best memories of him as a player? How will he be described in generations to come? In detailed analysis, describe and let us know here how you will always remember Steve Finnan during his Liverpool career? Steve Finnan arrived the same summer as Harry Kewell. Taking into account the former Leeds man's outstanding performances over the previous few years, and their relative positions (attacker vs full-back), it was little surprise that more people were talking about the signing of the latter rather than the former. Over the seasons to come, he still rarely made the headlines, but quietly set about the job of establishing himself as a key member of the team. It was a pattern than would continue for most of his career at Anfield. Finnan was never an attention-seeker, but no less committed to the team. He just quietly turned up, quietly turned in 7/10 performances in pretty much every game he played, and quietly went home again until the next match. Few made a fuss when Benitez came in to replace Houllier, and brought with him a new RB from Spain with the aim of making him first-choice, just as most people were relieved when Finnan quickly won over the Spaniard and won his place back from Josemi. His supposed replacement quickly sunk without trace, while Finnan went back to providing rock-solid, dependable performances every week. Typically for a player who was always understated and professional, he ended his career in an understated, professional way. He turned his back on football completely to set up a contracting firm with his brother... and such was his disappearance that when it came to organising a 10th anniversary celebration in memory of Istanbul 2005, a historic success in which he played a part, nobody knew how to contact him. A short-lived media campaign followed, after which a slightly bemused Finnan confirmed that he was alive and well, but sadly unable to take part in the celebrations. In my opinion the current squad needs a new Finnan, particularly at RB - someone who just goes out and does his job well, goes home quietly after and doesn't make the headlines, and never lets the side down. In a way, we've never really replaced him, though hopefully Clyne will be able to do so. On a final note, I was in the stadium the day he scored his only goal for the club against WBA and it was a cracker. Steve Finninho. No idea why he didn't score more, as he obviously had it in his locker. Somehow, I get the feeling that he was probably a bit embarrassed by the excitement caused by his scoring such a goal, unused as he was to the limelight. "Steve Finnan is undoubtedly one of the most underrated players to have represented Liverpool in a long time. The former Republic of Ireland international was a top class right-back who offered great attacking quality and defensive expertise. Signed from Fulham in 2003, Finnan barely put a foot wrong over the next five years, and was a mainstay of the side that won the Champions League in 2005 and FA Cup a year later. He arguably left the club too soon in 2008; he still had a few good years left in him." Hamann was so underrated in the midfield. He seemed to run the midfield without looking spectacular, but then he never needed to be. Didi rarely gave the ball away and did a lot of dirty work, and let Gerrard and others play with more freedom. I was gutted when he was left on bench in Istanbul, I will never forget the massive impact he had for the rest of that match, he somehow managed to stop Kaka and Pirlo running riot helping to turn the game on it's head. Didi was one of best signings we've made. An unsung hero. @Broomy, sorry for taking so long to write this. I don't have any individual memories of Finnan in any matches, but what I do remember is a feeling of stability. In my time (not including random Rodgers' selections such as Can and Marko) we've had Babbel, who lasted a season before illness, Carra, who was sacrificed for a pairing of Hyypia and Henchoz, Johnson, who just stagnated as a player, Kelly, who could have been very good if his hamstrings weren't string, and Flanno, who managed half a season of football before being injured for a year, as our rightbacks which means Finnan is the only one who lasted and was consistently good in that time. 3.5 mil for a player of his quality was a steal, and we won quite a lot with him in the team, in no small part down to him. It says a lot that 7 years later we haven't managed to properly replace him in terms of quality or consistency. Plus I think it was a pleasant surprise to see a footballer go into a normal life after football. Footage dating back to 1935 at Ewood Park where Blackburn knock Liverpool out of the FA Cup with a goal from Jackie Milne... Liverpool's captain was Jimmy MacDougall, a player who played 356 games in the 'inside left' position for Liverpool scoring 12 goals..
Liverpool's Team: Arthur Riley, Tom Cooper, Jack Tennant, Ted Savage, Tiny Bradshaw, Jimmy McDougall (c), Berry Nieuwenhuys, Vic Wright, Gordon Hodgson, Syd Roberts, Alf Hanson. How do you remember Jan Molby in a Liverpool shirt? "Few, if any, midfielders in Liverpool history have possessed an armoury of skills to match those of Jan Molby; unerringly accurate short and long passing, a thunderous shot and graceful control." In detailed analysis, describe and let us know here how you will always remember Jan Molby during his Liverpool career? "Signed for £225,000 to replace Souness, Molby proved to be a bargain signing. Despite slightly lacking pace and mobility, Jan played over 200 games for Liverpool, displaying a sublime range of passing and possessing extraordinary vision. He is Liverpool's all time record penalty taker, scoring 42 times from the spot." In the YouTube video above, Tony Barrett talks about Molby's goal against Man Utd and says that it wasn't televised. Few years ago it did surface and here it is. Love the Kop reaction here. What surprised me with this goal is how he glides across the pitch because I don't remember him for his mobility. He was always carrying a few extra pounds but it was his passing ability that stood out. He was a bit like Alonso, pinging it about all over the place. Had a hell of a shot on him too. I saw him a lot during the 85/86 season when we won the double and he was probably at his peak then. He was good at creating space and time for himself. A very clever player whose quick brain made up for the fact that he wasn't the fastest mover. Xabi Alonso + Mascherano combo reminds me of Jan Molby + McMahon partnership. The only difference is Mascherano is hopeless at the attacking end while McMahon has some great passes and bullet of a shot in him. Molby is very graceful, almost make the game moves in slow motion. Like his diagonal passes and dictating tempo of the game mostly. Was on the Kop for that one and got bent over a crush barrier when big Jan scored that stunner! Pretty frightening at the time I can tell you. Didn't see the goal again for over 20 years but it was how I remembered it. "For those who remember Molby as a gifted passer who was less than mobile in his latter years at Liverpool, it’s a nice reminder not to pigeonhole him. The dynamism he shows in the run was a key part of his game in his early 20s. For any midfielder in England in what was a very physical era, mobility was key. Molby scored 21 goals in the 1985-86 season, his best in a Liverpool shirt. His runs could be every bit as powerful as his passes were subtle. For anyone needing a reminder of his brilliance at this stage of his career it’s worth reliving his man-of-the-match display in the 1986 FA Cup final, which Liverpool won 3-1 against Everton to seal the Double. When Xabi Alonso emerged at Liverpool, many older fans drew comparisons with the Dane. It was understandable, given the cerebral way in which they played for the majority of their careers. But until 1987, when Molby suffered a foot injury that hampered his progress at Liverpool and sent him on a downward spiral that led to imprisonment for drink-driving, a better latter-day comparison would be Steven Gerrard. After all, the player whose boots Molby was trying to fill at Anfield when he arrived in the mid-80s was Graeme Souness. He had to have drive – and a decent shot. Molby’s ability to strike a ball was a weapon used to great effect from outside and inside the box. A minute after scoring this goal, he won the game with a spot-kick. Only Gerrard has scored more penalties for Liverpool. For all his obvious talent, there is a “What if …” element to Molby’s career. Had he played more often – and kept his body and mind in better shape in the late 80s – he could have been up there with Liverpool’s greats. But he struggled to hold down a place in the team after Ronnie Whelan replaced him because of injury in 1987. In 1990 he almost joined Barcelona, where perhaps his deft passing game would have flourished. A fee of £1.6m was agreed but the move broke down and Molby remained at Anfield. Many fans hoped Dalglish would play him as a sweeper – as he had done at times in the Double-winning season – but it was such an alien thing to do in England when 4-4-2 was the norm for every opposing team, that he had to wait for Liverpool’s decline before he could properly force his way back in. And let’s not forget how good Liverpool were from 1987 to 1989." my mate used to deliver his paper, and would always ry to think of a reason to knock on his door. Loved his skoll this fella but what a player. For younger guys think Alonso and Gerrard's passing ranges combined- and then through in flicks and tricks. Sounds far-fetched but we weren't the best team in the world for nothing, and the Great Dane was a really big (no pun intended) part of that. Go watch our winin he Cup Final over Sunderland to see him at his best, or even the 86 double final. Learned all her knew from Johan Cruyff, and it showed. best European player ever to wear our shirt, for me. Bill Shankly signed Geoff Strong in 1964 for £40,000 to replace the seriously injured forward Alf Arrowsmith..... Described as a lean, lethal striker, Strong had scored an astonishing 77 goals in 137 games for Arsenal a rate that few have matched before or since. Over the following six years Geoff Strong went on to make 201 appearances at Anfield scoring some memorable 33 goals... He was part of the side which won the club’s first ever FA Cup, under Bill Shankly in 1965. Ivan Ponting once said of Geoff Strong: "During Strong's Anfield sojourn, in which he helped Liverpool to the first FA Cup triumph in their history in 1965, then to lift the League title a season later as well as cutting a swathe through some of the continent's top clubs on the way to a European final, the whippet-slim Tynesider covered every slot but goalkeeper – and as Shankly once remarked, if the green jersey had become vacant, it was a fair bet that the prodigiously versatile Strong would have excelled in it." @The Flying Pig, what are your memories of Geoff Strong as a player at Liverpool? "Geoff Strong's time at Anfield coincided with my teenage years and the exciting early years of success after our return to the First Division. I remember a slim elegant looking player who did everything with a minimum of fuss. He was a striker at Arsenal when Shankly bought him. Striker, winger, midfield, full back. He never made any position his own and wasn't a regular but because of his versatility he featured frequently and never disappointed. Even though he often played instead of one of my three favourite players, Hunt, Milne or Gerry Byrne I was always happy to see him play. His early years at Anfield were before subs were allowed. He was hobbling through the second half of our Euro Cup Winners Cup Semi against Celtic at Anfield when he jumped off his good leg to head the winner. Tough, committed , heroic. A real crowd pleaser we loved him." I recall he had problems initially with fitnesslevels expected by Shanks and our training regime leaving him physically sick.It was a common chant of Gordan Milne/Geoff Strong from different sections of the kop when they vied for the midfield berth. He was a very classy central defender but Tommy Smith limited any scope for him at Anfield.He could pack a terrific shot at times-I remember a European goal against Juventus in the old Cup Winners Cup. As forum member @The Flying Pig mentioned above there, his early years at Anfield were before subs were allowed. Here's a stat you may not know... The tag ‘12th man’ would soon be attached, and Geoff Strong became the first ever substitute to score for Liverpool when he replaced Chris Lawler at half time and scored the equaliser in a 1-1 draw with West Ham United at Anfield on September 15, 1965. Many fans will remember him for the 1965 FA Cup Final... The highly influential Gordon Milne was out injured for the match against Leeds United at Wembley, it was Geoff Strong who replaced him and produced a key performance to negate the threat of Footballer of the Year Bobby Collins. Liverpool went on to win the final 2-1, our first ever FA Cup. Great memories @longtimered, you mention Geoff had problems initially with fitness levels expected by Shanks and our training regime leaving him physically sick... I remember a story that a few days after joining Liverpool and experiencing Bill Shankly's training regime, Strong complained: "What have I joined here, a bloody commando course!" Perhaps the most important date of all time in the history of Liverpool Football club is the 1st December 1959, but given that most of you reading this will not even have been born then, for the record that is the date when Bill Shankly walked through the doors as the manager of our club for the first time. At the time we were just a second division side in the days when there was no premiership, very little televised football and Tottenham Hotspur were arguably the best team in the top tier (which was then called division one ) and they proved that by virtue of winning the double the following season. At the age of eight I was too young to know the significance of the man from Kircaldy taking over, but by the time my tenth birthday had come round, Bill had ensured we had been promoted from the second division and were taking the first steps into becoming a force in English football and stepping out on a path to take on the world. Every little thing that we accept and take for granted nowadays in terms of the history, stature and prestige associated with the name of Liverpool FC, is directly as a result of the job that the great man did in moulding that team to become winners under his unique management style. But before we could conquer England and Europe, we had to become top dog locally and Everton were firmly established and by far the most dominant club on Merseyside. In those days they were know as the “mersey millionaires” due to their affluence and association with John Moores, who was the father of our former chairman David Moores. Early days up in the boys pen was my apprenticeship in the match day routine and I watched in awe as the bolder members of that fraternity climbed the cage, commando style and then scramble down the far side into the steps of throng beyond and the Kop itself. Never quite having the bottle to attempt such a quest, I managed to acquire enough pocket to enable me to legitimately gain access to the kop via the turnstiles and duly began the ritual of arriving at the ground and hour and a half before kick off to ensure I got in to become a fully qualified member of the kop choir in season 1963/4. In my very first year then of regularly going to watch my team play, my pocket proved to be money well spent as we won the league. How lucky was that! Countless millions of kids throughout the world have followed their team with barely a sniff of success, so to see us become champions in my very first season of football, bearing in mind where we had come from as a club, almost defied belief. The sense of occasion and the incredible atmosphere in the ground soon became infectious and supporting the club became for me, like so many, a way of life now. Supporting the club has become ingrained in my very soul and those forty plus years of memories will live with me forever. Those early days in the Kop, the singing and the banter were unforgettable times. “She loves you ” by the Beatles, followed of course by “You’ll never walk alone” and the hairs would stand up on the back of your neck in anticipation of the lads coming out. Everyone had their own “speck” but remaining there amidst the crushing was, of course, another matter but that was all part of the experience. Yes we had the good times but we also had the bad ones too and the importance of never taking anything for granted has stood me in good stead for as we know, football, like life itself, has a habit of kicking you in the teeth at times but without a doubt, the successes on that hallowed turf have far outweighed the bad times. Bill’s achievement though, in transforming us from second division nobodies to English champions in the space of five years was the springboard to everything that has happened since and he personally transformed us into the household name known throughout the entire world. Proving this was no flash in the pan, the F.A. Cup was won for the first time in our history in 1965 with an extra time victory against a young Leeds United managed by Don Revie in the first of many encounters against a team that would become great adversaries of ours both in the sixties and indeed the seventies as well. Arguably our toughest opponents in that era, that tough, gritty, Yorkshire mentality was synonymous with the attitude of the club and the name Revie is as revered at Elland Road as Shankly is on the kop. Black and white television pictures of Ian St John twisting in mid air, like a salmon, to head the winner at Wembley remain some of the most iconic visions in the history of our club. At the time it was the jibe of Evertonians that we “tell it to the marines” when Liverpudlians talked about winning the cup, this being a sarcastic reference to the army band that always marched and played before the match in those days. The1965 cup win laid to rest that particular bogey and that jibe would never be heard again from the blue half of Merseyside which, from then on, would never quite be the same smug place ever again. We had also made a very good start in European football in 1964/5 and may well have gone on to win the European cup. The memories of the injured Gordon Milne and Gerry Byrne parading the cup around Anfield before the game when we hosted Inter Milan in the European Cup are still with me to this day and the noise was incredible. Arguably, we beat the best club side in the world that night and had we not been cheated in the return semi final on that infamous night at the San Siro, it might have been Bill that became the first British manager to win the European Cup and not his great friend, Jock Stein of Celtic. Not to be outdone though, we would again become league champions the next season and also went all the way to the Cup Winners Cup final at Hampden Park but ended up losing finalists. There would be no further success for this team though and we got a very rude wake up call with a thrashing by an Ajax team in 1967 that had unknown youngsters called Cruyff and Neeskens in their ranks. Their style of play would go on to become the benchmark in Europe for years and their academy structure, style of play and training methods are copied to this day around the world. Domestically it was Manchester United who picked up the mantle as the team to beat with the attacking prowess of Bobby Charlton, Denis Law and the genius George Best. To this day, they remain the greatest opponents I have ever seen us play and their successful period between 1967 and 1971 was a sobering time for us all and the signal for Bill to assemble his second great team. Lawrence, Lawler, Byrne, Milne, Yeats, Stevenson, Callaghan, Hunt, St. John, Smith, Thompson. Tommy Lawrence : due to his “nourished” appearance, Tommy was unkindly christened the “ flying pig” but he was a very steady goalkeeper for us. Chrissy Lawler ; the quiet man of the team but years ahead of his time, in that he was an attacking full back who had the ability to ghost into the box unmarked and score. He scored in excess of fifty goals in his career and incredibly none were penalties. Gerry Byrne: “Gerry Byrne, crunch crunch “ was the chant from the Kop in those days. As hard as nails in the tackle and proved that by playing most of the 1965 cup final with as broken collar bone. Gordon Milne : Cultured right midfield but in those days the position was known as right half. Very under-rated and busy little player. Ron Yeats ; Towering centre half, brought from Scotland around whom Shanks built his team, calling him the “colossus.” He was our captain in the sixties and is still involved with the club to this day. Willie Stevenson : “ Billy Stevo” was another cultured midfielder, had a magnificent left foot and provided the guile in midfield. Roger Hunt : “Sir Roger Hunt “ fantastic goal scorer and predator around the box but was also a willing worker, unselfishly running off the ball to create space for others. Ian St. John; another scot , the “saint” achieved iconic status at Anfield as a very combative centre forward and along with Yeatsy, formed the basis around which Shanks built the team. Tommy Smith : “The Anfield Iron “ was another hard man in the team and gave us the insurance for the other midfielders to get forward. A local lad and another member of the side who went on to become a stalwart in the seventies team. Peter Thompson : as skilful as anyone I have ever seen play for Liverpool. His flair and ability was phenomenal. ”Brazil, Brazil” was the chant from the kop as he curled free kicks into the goal as well as anything Jairzinho could produce. Jimmy Melia: who played the first half of the 1963/4 season but was in the twilight of his career. Alf Arrowsmith : who formed a devastating partnership with Roger Hunt in the second half of the season and was an absolute revelation in scoring 15 goals in 20 games but his career was prematurely cut short by a succession of injuries. Who knows how good he might have been had he stayed fit. Indeed it is staggering statistic that in that 1965/66 season, in the process of winning the league, we utilised just 14 players and that included just 5 appearances ( two as substitute ) by Alf Arrowsmith and a solitary appearance, in the last match, by Bobby Graham. Quite a phenomenal achievement when you consider the squads used nowadays, even though it was considered a common practice for the lads in those days to play on with minor knocks in order to retain your place in the side. Iconic times, indeed, to be a red. Satnam, what are your earliest memories of following Liverpool? In early 1970's I went to my first game, no one in my family drove and my parents would not allow me to travel on the train so we asked a friend of the family to take me to WHL to watch us play Spurs. I was absolutely devastated when the game was postponed due to fog.. I did go to again in 75 to WHL which I think we won 4-0. My visits during the early years were all to away London matches, I remember getting squashed at Loftus Road when we beat QPR via a Brian Hall goal. I also went to Highbury on numerous occasions and do remember a mid-week game where I could only see one half of the pitch because of the fog (I was in the North bank, couldn't get an away ticket) and I think we lost. I steered clear of Stamford Bridge and WHU during that era due to the racist element of some of their supporters. I was due to go to the Hillsborough semi final but due to work commitments I had to go into the office that day. I took my small portable TV into work and just could not believe what was happening in front of my eyes. When the fatalities were announced the tears were just flowing. I totally forgot to mention to my family that I wasn't going to the match and that I was at work until I got home that evening, they all thought I was at the semi. My ticket would have been in the Leppings gate end as well. I was single during the Souness management era and went to my most number of home and away games, I remember seeing Jamie Redknapp make his debut I think against Coventry (or he scored a screamer from a free-kick?). I also made the long trip to Norwich and whilst in the city centre we got stopped by the police and told to remove our colours, we missed the start of the game when Gary Gillespie scored for us and I think we lost. I vowed never to go back to Norwich! Our football in this era was just dire but going to the aways was fun..
Digger, Aldo and Beardsley debut at Arsenal was superb, it was a hot summers day in August and I was in the North bank again. I managed to keep quiet when we scored. On a separate occasion I was at our semi final against Palace at Villa Park, again I kept quiet when we scored unfortunately a couple of Reds around me jumped up and I was hit by a Palace fan. I t was a bad day all round. I have been to Europe a few times to see us play, went to our final in Athens which was terrible. Our flight was diverted, got tear-gassed by the police and we lost! Also been to a few CL aways with the wife which was fun. I have been regularly going to Anfield and a number of away games since late 90's and my youngest daughter has been going with me since she was 10, it's a 400 mile round trip so we make it up around 8 times a season and I manage to go to the same number of London/Midland aways as well. I prefer standing and cheering so we are always in 304/305/306 in the Kop and of course at aways its standing most of the time anyway. So many other memories but this is my starter for 10..."
@longtimered, what are your earliest memories of following Liverpool? "I can tell you first match was Sept 1955, Liverpool 2 -1 Lincoln City League Division 2 – I was taken by my uncle who was an Evertonian! (a narrow escape) A guy called Alan Arnell scored twice. Lawrie Hughes as centre half, Ronny Moran at left back, Alan A'Court as left wing and Billy Liddell at centre forward. Crowd of about 40,000 and I stood in the paddock in front of the main stand. Kop held about 28000 in those days I think - unchanged till 1970's. I'll never forget the sight walking up walton breck - the white kop roof and the steps up. No singing of course just loud roars when liverpool attacked - and rattles (anyone remember them?). Only other game that season was FA Cup at Maine Road versus Man City which was 0-0.Trying to remember the old Kemlyn Road stand - think it had a lot of pillars." @geebo, what are your earliest memories of following Liverpool? "The first game I remember was the 1971 cup final. I wasnt old enough to appreciate it but I remember Hughes, Smith and the blonde left back Lawler. And of course Keegan and Toshack. I also remember Charlie George for Arsenal who I think scored. After the game I switched allegiances for a week to Arsenal because they won. But then I decided that I had chosen Liverpool first and must remain a Liverpool fan. Coming from London meant it was hard to see a game and I didnt have any relatives interested. Then, at about 12, the son of the barman of my father`s local pub, took me to Upton park to see West ham v Liverpool. The game was a draw, but I was so excited to see the players for real. I remember Jimmy Case had a fierce shot, and rattled the bar once. I remember I had a red and white woolen scarf and got someone to sew the names of the players in red on the white bars. At the age of about 13 I had lots of programs. I bought them from somewhere and they were posted to me. I think they were advertised in some football magazine. 1977 was a great year. I was allowed to stay up late and watch the European matches on the TV. I remember in 1976, listening to every European away game on a radio that faded in and out. I even bought the LP of that UEFA final. But winning the European cup for the first time was magical as a kid. It was amazing to think the team took longer to travel away in Europe and Europe seemed so far away. Also, only having one substitute. I was heart broken when Keegan left, but was immediately amazed by Dalglish. In the London area they always showed Liver SUnday matches on TV. They were often Liverpool away to a London team. I remember the way Liverpool would kill games in the first half and at the start of the second. They would take the danger out of the other team. They would pass and pass, and slow the game down. But they were always alert and in control, and in one moment, they could produce a stunning move and get the away goal they wanted." @Tetteh_Dalglish, what are your earliest memories of following Liverpool? It was probably losing the final to Wimbledon. But my most poignant memory around that time was the 1989 FA cup final. Watching Liverpool and Everton fans laying reefs together following HIllsborough, listening to the "Ferry Cross the Mersey" tribute, and seeing the way the rivalry plaid out in the friendliest but most hotly contested cup Final I'd ever seen - well, it was just unforgettable. That Rushie was making such a memorable come-back from sickness and that Aldo scored and then Rushie came on and scored (from that amazing cross from Barnes!) to win it, well, there just aren't any words for it. @Tetteh_Dalglish, Who were your early heroes? Who did you pretend to be while playing at the schoolground, who was your idol and why? I always pretended to be John Barnes. As an 8-10 year old watching Liverpool, he was probably the best player in the country in 1987-90. His skill was simply phenomenal. I spent ages trying to curve the ball with the outside of my foot the way Barnesy did. @Tetteh_Dalglish, We've all witnessed the emotional charged nights at Anfield and abroad, the extraordinary stories, the unforgettable memories... What is your most treasured Liverpool moment so far? I've only gotten to Anfield the one time, sadly. It was a merseyside derby in 2008. After a bit of a bender of a night, we set off from London in the morning and ended up arriving 5 minutes late - but too late to catch Torres' only goal. Still, we were sat not too far from the Everton fans and the banter going back and forth was sensational. And the goose bumps I felt when "You'll Never Walk Alone" rang out - it was beautiful. Then hugging random strangers in a pub in Boston when Liverpool won in Istanbul - well, that day is still one of the best days of my life. Here you go @lfc.eddie, your way too young to remember this!!! Liverpool 6 – 5 Newcastle : Many people comment on our recent 4-3 win over Newcastle as one of the greatest games of the Premiership, but back during the 1909/10 season, over 22,000 Liverpool fans were treated to an even more fascinating encounter against Newcastle United at Anfield in the Division 1. Liverpool finished the 1909/10 season as runners up, just five points behind the eventual Champions Aston Villa. However, on the 4th of December 1909, Liverpool beat Newcastle 6-5 after being 5-2 down at half time…. Arthur Goddard, Jimmy Stewart and a brace from both Ronald Orr and Jack Parkinson secured a thrilling win for the Reds. This match is still spoken of fondly among Liverpool fans as one of the most fascinating and enchanting comebacks by the Reds. Newcastle finished the 1909/10 season in 4th place just three points behind Liverpool. This was also the season Liverpool beat Manchester United 4-3 at the opening of the Old Trafford ground! The main forward of Liverpool’s team during those years was Jack Parkinson who scored a wonderful 30 goals in only 31 games that season. Liverpool’s team which beat Newcastle 6-5 included : Sam Hardy, Tom Chorlton, Tom Rogers, Robbie Robinson, James Harrop, James Bradley, Arthur Goddard, James Stewart, Jack Parkinson, Ronald Orr, John McDonald. Any memories of following the Reds at home and abroad? Any crazy journeys getting to the grounds? Got some old photos knocking about of great Wembley outfits, celebrations, moments, stories or tales, share them with us here! !